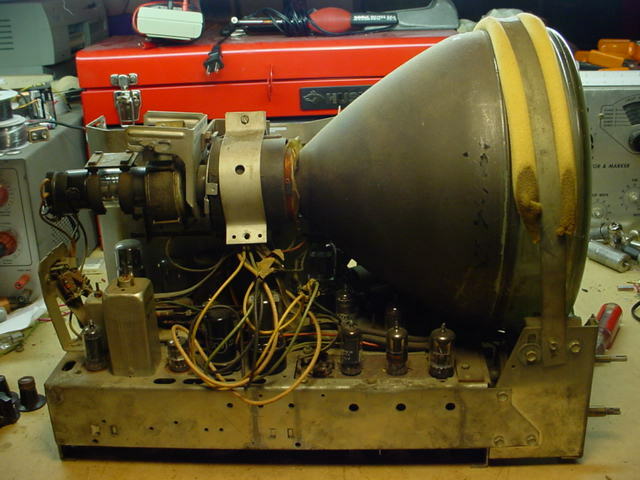 I bought this 1949 General Electric 805 at a VRPS auction in November 2003. 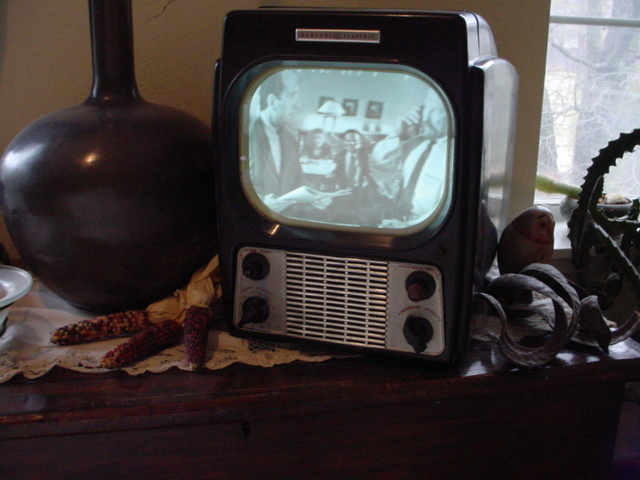 The TV was in good shape with no cracks or chips in the bakelite case. 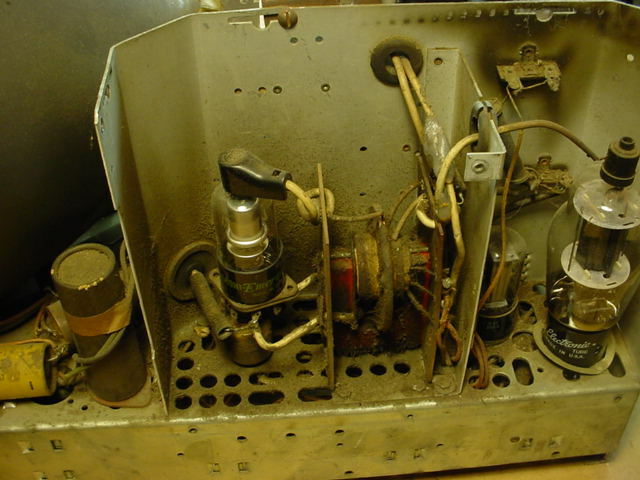 When I first disassembled the television by removing the two front screws and the four bottom screws, I immediately knew this television had been repaired quite often in the past. The second half of the high voltage cage was missing. The deflection yoke was replaced and the new yoke did not fit properly. 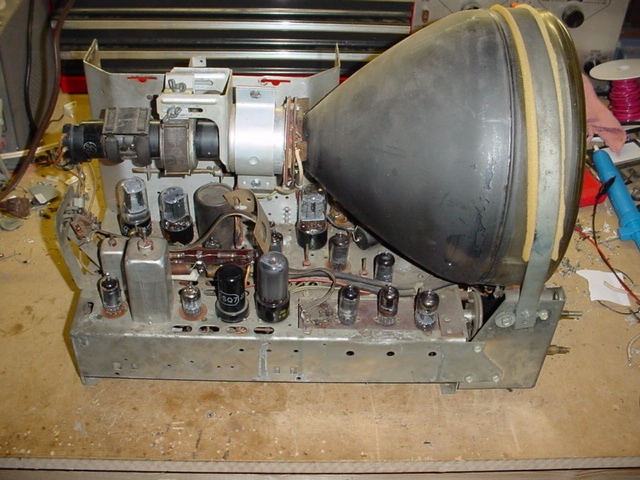 The 10BP4 CRT also appeared to be a replacement as well. 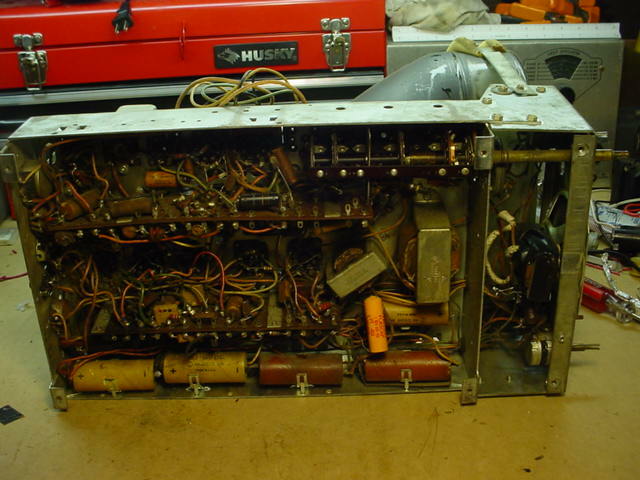 Below is a picture of the innards when I first took the chassis out of the case. 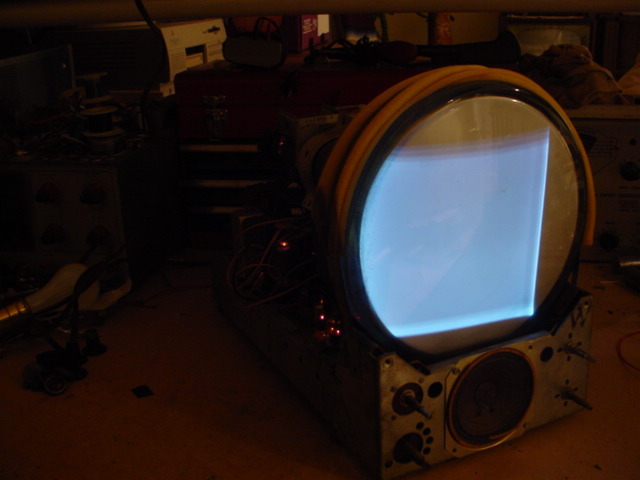 This television is transformerless and requires a voltage doubler to obtain the B+ voltage of approximately 275V and the tubes' filaments were wired in series to operate off mains without a transformer. Therefore, if one tube has a bad filament then more than half of the other tubes will not light up. The previous owner replaced the selenium rectifiers for the voltage doubler with 1N4007 diodes and a few capacitors. Though, there are still a lot more capacitors to replace. The following pictures show the other side of the chassis and bottom view of the chassis. I replaced most of the electroylic capacitors and decided to try firing up the television, though I would not recommend it because it is wise to replace all of the other paper capacitors before doing so. The television easily came to life with a bright raster that was shifted to the left. 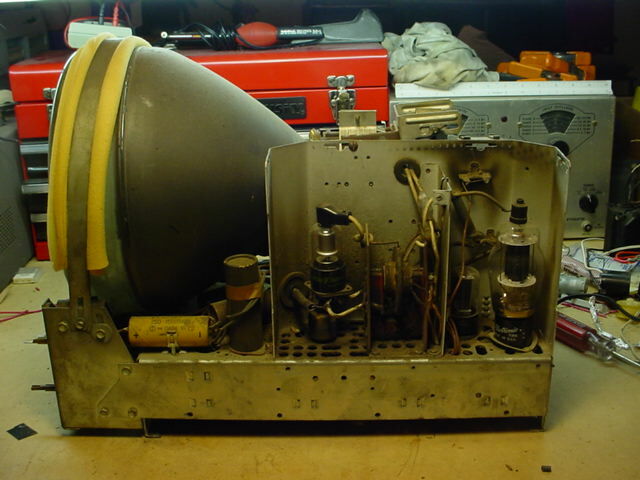 I knew from experience with repairing the Admiral 19F1 TV that the ion trap might be responsible for the shifted raster so I adjusted it to center the raster. Unfortunately, the raster did not budge very much so I began to fiddle with the focus coil and the deflection yoke. When I finally got the picture in a reasonable area, the focus coil and yoke were in awkward positions. The yoke was tilted to the right bad enough that it seemed as if the CRT neck could break. Although this setup was not very convenient, I proceed to try and get a picture. Many of the video amplifier tubes were weak so I replaced most of them with what I had in hand, but nothing was quite good enough to get a picture or snow on the screen. At this point, recapping the entire television was the only necessary option left so I spent several days replacing over 20 capacitors and restuffing those that were visible on the chassis by pushing out the old innards out of the paper body and fitting a new one in place. Finally, some snow came in on several stations, but there was still no picture. I fiddled with the controls for quite some time until I realized there was a picture coming through but the horizontal frequency was way off. I noticed a variable coil in the rear of the chassis for the horizontal frequency that did not look original and may be off. I ended up adjusting the coil a lot by rotating the screw more than 15 times to bring the horizontal frequency back to where it should be. Once a weak picture came through, rather than the traditional vertical picture flip, the horizontal was flipping badly. 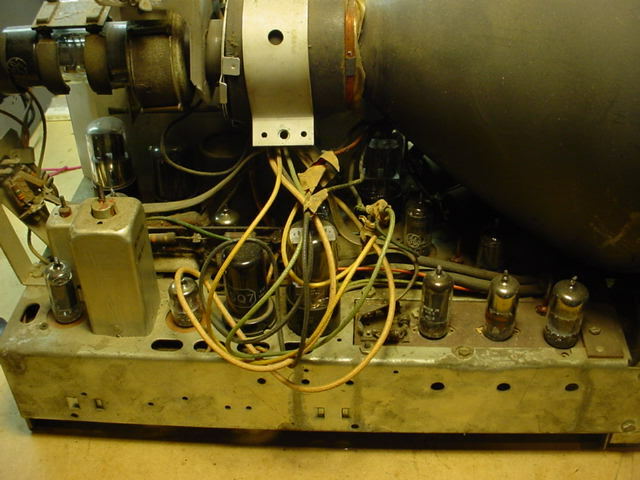 The sync separator tube was not functioning properly so I replaced it along with most of the other tubes in the horizontal and vertical circuits. After replacing the tubes and tweaking with most of the controls, the picture became stable. Unfortunately, the picture was still shifted to the left and the vertical size was insufficent to fill the face correctly. One possibility was insufficent high voltage from the flyback, but the picture was quite bright, the B+ voltage was just right, and there was a nice arc from the flyback to a well-insulated screwdriver so this was not the problem. I concluded that the replacement deflection yoke was useless. I fortunately found someone who had a GE 805 parts chassis and was kind enough to sell the original deflection yoke to me for a good price. The positioning problem was immediately resolved after replacing the entire yoke, repositioning the focus coil, and a few control adjustments. Below is a picture of a show with a clear crisp picture. The stations still seemed weak, but I figured out how to use the fine tuning to strengthen the stations and finally the sound came in without any problems. Below is the completed chassis; all cleaned up and with the new deflection yoke. I ran this television for over a hour at random times and it ran well as a final test.